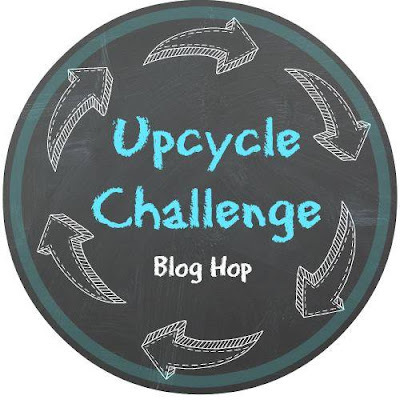 Welcome to our Monthly Challenge Blog Hop! I've joined a group of creative bloggers to bring you a monthly challenge blog hop on the 2nd Monday of each month. We're running a bit behind this month because of the holidays and posting a week later. For January, the challenge is to upcycle cans, glass or plastic. And all of us can relate to repurposing anyone of these items from time to time! I love recycling wine bottles and have been known to rescue them out of other people's trash! Lol! My easy to follow tutorial shows you how to upcycle a wine bottle by creating the look of melted candle wax over a wintry scene using hot glue, mod podge, and a paper napkin. I think the end results are quite lovely! The warm, decorative design adds a whole lot of charm to anyone's décor during the winter months! Let's begin by wiping the wine bottle with alcohol to remove any oils and dirt that may still be there after removing the labels and washing with soap and water. Next, using a sponge, paint multi-surface white acrylic craft paint over the bottle and let dry. Next, separate the top printed layer of the napkin paper from the rest. Then arrange how you want the design of the napkin over the lower portion of the wine bottle. Then, paint a layer of mod podge over that area. Carefully lay the napkin down on top of the mod podge, using plastic wrap to smooth and remove any wrinkles. Fill in with more mod podge and napkins to cover bottom of bottle and use the plastic wrap to smooth everything out. Let dry. Once dry, add another coat of mod podge over the napkin to seal. over the napkin edges to help hide the line edges. Let dry. Next, apply vertical rows of hot glue beginning around the top of the bottle and let the hot glue drippings run down slightly past the top edge of the napkin. Allow the hot glue drips to dry before filling in more over and between the first row drips. Be sure to stagger the lengths of the hot glue drips. Add an LED votive candle on top of the bottle opening and run drips of hot glue around the sides to attach. Once the glue has completely dried and is no longer warm, pry open the LED votive candle with your hands, moving it side ways to be able to turn on the light underneath. Do not remove completely and replace the votive candle back intact to bottle. And finally, add dabs of white acrylic paint over the dried hot glue drips to add texture and dimension to the look. Topped with a simple white LED votive candle and drips of faux hot wax, this upcycle wine bottle not only looks elegant, it provides mood lighting with the LED candle's soft glow. Don't you just love this look! Please visit my co-hosts to check out their creative upcycle projects. 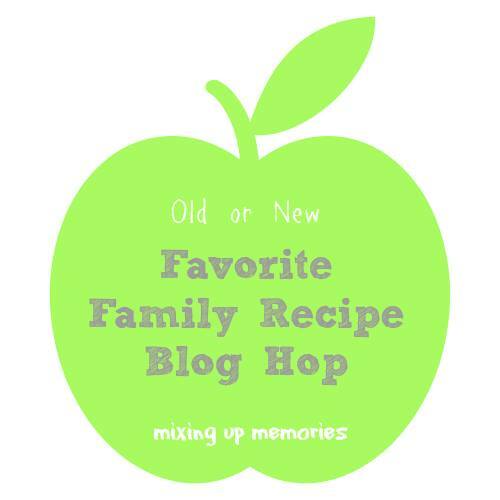 And don't forget to come back next month on February 12th when we share our Family Recipes! What a lovely idea! Pinned! Gail, this is so pretty! I always love what you can do with napkins! This is impressive! What a lovely winter candle holder idea. Your tutorial is great. Pinning and sharing. Excelante. Tendré en cuenta esta tutorial para las próximas navidades, porque queda realmente bien. Gail, This is so pretty! Love the easy effect using the hot glue for the melted wax. It looks spectacular on this bottle with the pretty winter scene! Great upcycle! That is amazing! I have used napkins to decorate Easter eggs before but I have never considered using them for other things. My brain is really running now! Hi Gail, your wine bottle makeover is so pretty and creative of you! Thanks for sharing at Cooking and Crafting with J & J. Your bottle is gorgeous! A piece of art! I shared it in my Chloe's Crafters Facebook group! Thanks for sharing at Celebrate Your Story! What an awesome upcycled project! It's beautiful & your tutorial is great. Thanks for sharing. That's so cute, what an amazing upcycle! Thank you for sharing at The Really Crafty Link Party this week. Pinned! Very creative! What a smart idea to use hot glue to create the dripping snow and ice. Thanks for sharing with SYC. Gail that is such an original and oh so pretty idea. I know how hard it can be to decoupage napkins. The top with the glue is a new idea to me. I'll have to give it a try. I am SO in love with this project!! I love working with napkins and am definitely going to try this. I"m not following how you added the votive though . . . I'm thinking I may add the fairy lights inside but not sure if they'll show through. Pinning and I think I'm going to try this with a Valentine napkin/design!